Mandraki marina is a public port that does not have the facilities of a modern marina. The port, like the town of Rhodes, is located at the northern of the island, below the medieval castle and opposite the Market Square of Rhodes, 30 minutes from the airport by taxi or bus. The Yachting Power meeting point is directly on your yacht, contact our base manager by mobile phone upon your arrival. One day or at least a couple of hours before you return to Rhodos charter base (at the end of your charter), please inform our base manager (by mobile phone) about your ETA at the port, in order to be able to help you with the berthing procedure. There are some mooring lines, but our staff may require you to use your anchor. Water and 220V power is available on the quay. Fuel is delivered on the quay by car-tanker. The main street is a 7-minutes walk from the dock. A 24-hours taxi stand is also located across the road outside Mandraki marina. 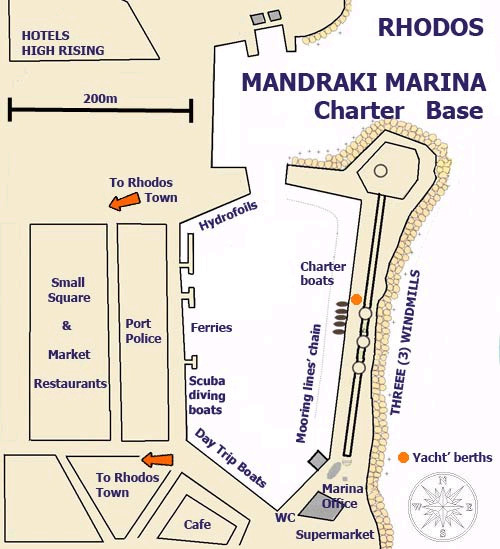 The local bus terminal of Rhodes town with connection to the main villages/ beaches/ sites of the island (such as Lindos) is about 300m away from the yachts’ berths. ATM cash point and many banks are located in the town near the yacht’s pier. Parking area (unguarded, quite safe) is also located into the marina, but you better consult the base manager about the best place to leave your car. WC / Toilets / Hot water showers are available near the offices. There are two supermarkets within the harbour that are open 7 days a week from 07.30 to 21.00 during the summer. There are various cafes, taverns and restaurants within walking distance of the ancient town and market square. Beware of the rocks and shallow waters on the north side of the port entrance. If you have to drop your anchor, leave as much chain as you have in your chain locker, so that your anchor will not stuck to the heavy chain of the mooring lines which is installed parallel to the dock at a distance of approx. 30m. Depth at this point is 20 m and you probably will need a diver to free your anchor.